Computers allow us to do things today that were barely dreamed of 60 years ago. Today, computers and networks provide us a personal space in which we can share our innermost thoughts and feelings on a large network with others. 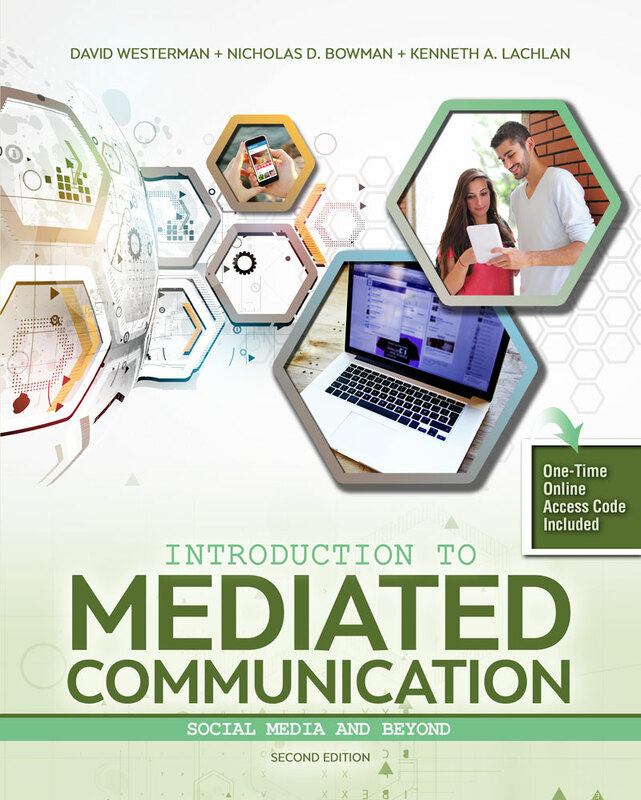 Introduction to Mediated Communication explains and discusses mediated communication through a functional approach - focusing attention on how people use computer technology to accomplish their communication functions. Rather than focus on the nature of the medium itself and what sets it apart from more “traditional” media, Introduction to Computer Mediated Communication focuses on what functions people use technology for, and how people use technology to accomplish their multiple communication goals. By focusing on functions rather than channels, the publication provides instruction into the reason people use media, rather than simply discussing various technological products that will soon be outdated. Focuses on the degree to which new media technologies now permeate all aspects of human communication, blurring traditional distinctions between mass, interpersonal, organizational, and health communication realms. Analyzes how technology is used to satisfy four major reasons for communication in general: informational goals, relational goals, persuasive goals, and entertainment goals. Includes a regularly updated website to discuss the evolving technology. The website includes links to growing social media applications, discussions, videos, and more. And in true Web 2.0 fashion, the authors will even encourage students to participate early and often. Features Computer Mediated Communication in Action vignettes that apply concepts to real life scenarios and cases. Chapter 1 What Is (Mediated) Communication? Chapter 2 What Is the Internet? Social Media—Are We All Media? Online Interaction: Boon or Bane? Presence: At the Heart of MC? Do We Want to Touch Everyone We See? (Ph.D., Michigan State University, 2007) is an Assistant Professor in the Department of Communication at North Dakota State University. His research and teaching focuses on communication technologies and how people use them to accomplish their goals. His research has been published in such outlets as Journal of Computer-Mediated Communication, Cyberpsychology, Behavior and Social Networking, Computers in Human Behavior, and Internet and Higher Education. Dave is currently enjoying the beautiful climate of Fargo, North Dakota with his wife Catherine. He is still anxiously awaiting the day when the Buffalo Sabres finally can hoist Lord Stanley’s Cup. (Ph.D., Michigan State University) is an Associate Professor of Communication Studies at West Virginia University, where he founded and currently serves as a Research Associate in the department’s Interaction Lab (#ixlab). His research focuses on the psychological and sociological impacts of communication technologies—specifically digital media—and how these impacts have influenced the human communication process. Nick has authored or co-authored nearly four dozen original empirical studies and a dozen book chapters on the subject, with much of his work focused on video games and social media applications. He currently serves on the editorial board of several research journals, including Media Psychology and New Media & Society, is an editor for both Journal of Media Psychology and Communication Research Reports, and contributes regularly as a reviewer for the American Library Association’s CHOICE Magazine. In 2016, he was awarded a WVU Foundation Outstanding Teacher award, and was also named a 2016 Eberly College of Arts and Sciences Outstanding Teacher. Nick is a native of St. Louis, where he split his time between the bohemian bustle of University City and the creeks and hollers of suburban-rural Jefferson County. After graduating from the University of Missouri-St. Louis (B.A., ’03; M.A., ’04) he worked as a newspaper reporter and in government relations before leaving the state to pursue his doctorate. He currently lives in the heart of Morgantown, West Virginia with his partner—in research, in the lab, and in life—Jaime. Both are avid travelers and collectors of history and popular culture artifacts, and when they’re not in the office (physically or digitally), they can usually be found on the road, searching the country (here or abroad) for remnants of entertainment culture past and present to add to their expanding collection of comic books, video games, and movie posters. Ken Lachlan is Associate Professor at the Department of Communication at the University of Connecticut. Prior to his academic career, he worked in public radio and television promotions for several years. His research interests include the psychological effects of mass media, health and risk communication, social robotics, and new media technologies. Recent publications have appeared in the Computers in Human Behavior, Media Psychology, and the Journal of Applied Communication Research, to name a few. Ken considers himself mostly a quantitative scholar, preferring experimental and survey methodologies in investigating his areas of interest. He has also served as a consultant statistician for various companies and government agencies. He holds a dual B.A. in Communication and Sociology from Wake Forest, an M.A. in Mass Communication from Bowling Green State University, and a Ph.D. in Communication from Michigan State. An avid jogger and diehard hockey fan, Ken lives in Hartford, CT with his wife and their cat.